1What is an Advanced Soul? 2How to spot an Advanced Soul? 41. They have a penetrating gaze. 52. They have soft and comforting touch. 63. They have a gentle and soothing voice. 74. Their aura is very deep and still. 85. They are sincere in all their interactions. 96. They will gladly show the way, yet never impose. 107. They believe in the Oneness and connectedness of all things. 118. They are comfortable in their own skin. 129. They believe only in "what is". 1310. They are not materialistic. 1512. They honor "alone" time. 1613. They soak themselves in nature and connect with the animals. 1714. Their love is their compass. When advanced souls gaze at you, you feel like they’re looking through your soul. Their gaze is so deep it penetrates deep down your core. Their eyes are steady and do not move much. They’re fully aware what’s inside and outside of you. Their eyes shine with the light of deep peace, compassion, and wisdom. When they speak, they do it with depth and refinement in the voice. They’re not loud. They offer instructions that are wise and free of conflict, though, at times it contradicts with what you think is best for you. For them, everything comes from only one Source and only one Spirit connects us all. Their perception of the world goes beyond frontiers, beyond skin colors, beyond borders. Their spirit is magnanimous that they feel connected even with the birds of the air and the fishes of the sea. 9. They believe only in “what is”. Despite their physical needs, they don’t succumb to luxuries and extravagance. They only strive to live comfortably and simply while doing their business on Earth. They’re fully aware of their temporary physical existence, thus they thrive in an egoless world of their own. They know that ego is an illusion of a fake self, and because they don’t identify themselves with such ego, their life is not weighed down by it. 12. They honor “alone” time. Their most favorite retreat is spending time with nature. Nothing beats the freshness and tranquility that nature brings. They consider nature to have a spirit that responds deeply with their spirit. Animals respond to them eagerly, as if they understand every word an advanced soul says. Even the fiercest of animals seem to lay down its defenses in their presence. Amazing! So true! Everyone I can check. I would love to talk to others about this. How do we all align? Interesting article. 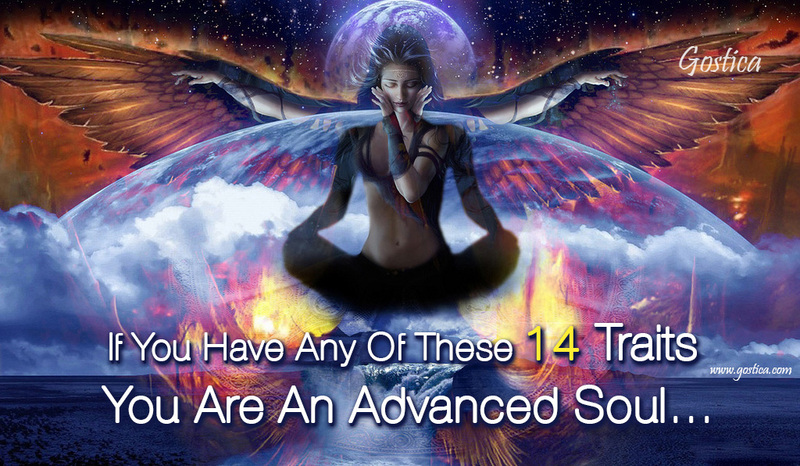 Must one have all 14 traits to be advanced or maybe a certain amount. I am almost all of these but the voice. Just curious….